You’ve read about Operation Frosty Box I & II from back before we even opened. You’ve seen Operation Frosty Box III from our big 3-bbl brewery expansion almost two year ago. 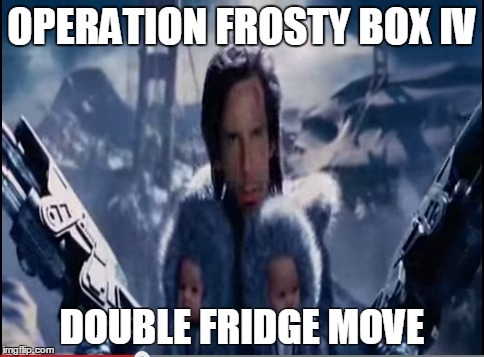 Now we bring to you, Operation Frosty Box IV – Double Fridge Move. 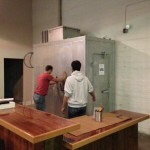 Our new brewery tasting room will use the same fridge as our current brewery tasting room. 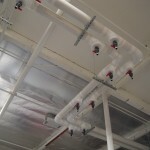 At the new brewery, we need to install a fire sprinkler in the fridge before we open. It’s impossible to install a fire sprinkler in a fridge that isn’t there. Move our current tasting room fridge to the new brewery and move our old tasting room fridge back to the current brewery without interrupting the flow of beer to customers and without letting our beer get warm. 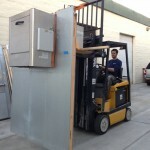 The first problem is that the old fridge is way bigger than the small serving fridge at the tasting room. 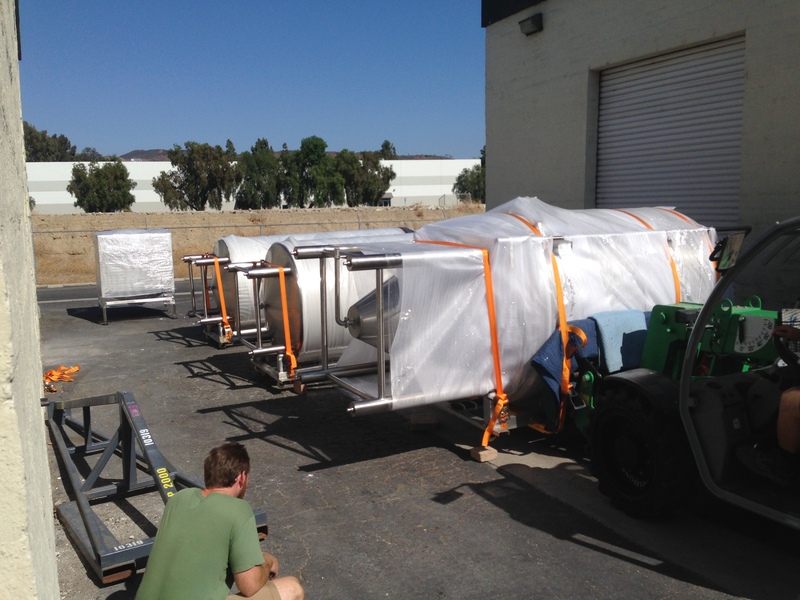 To accommodate the bigger fridge, we had to de-bolt Anita and Hedi from the ground and transport them over to our new brewery. 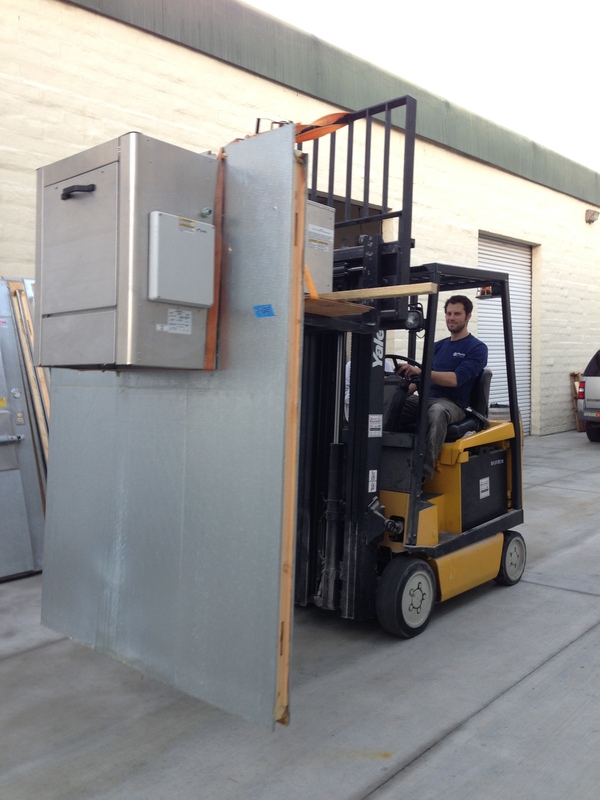 Move the tasting room fridge over to the new brewery. 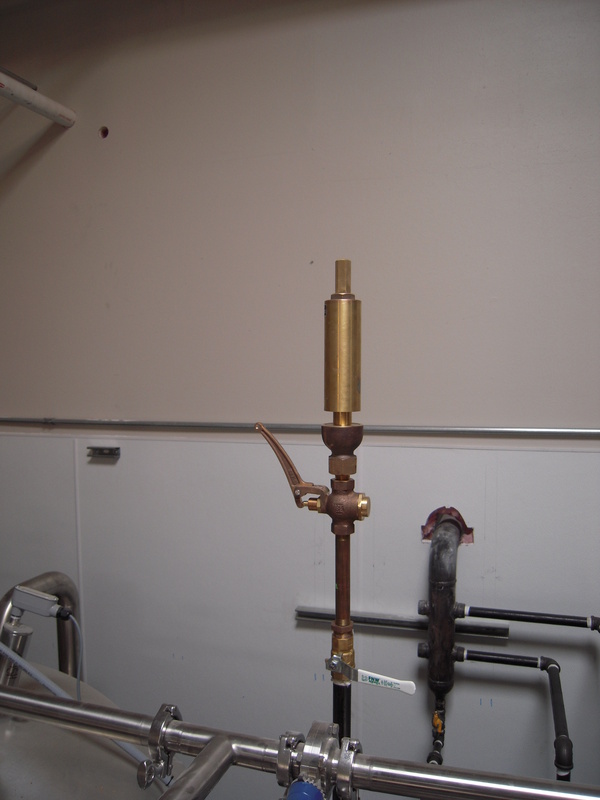 We had to remove all serving equipment (taps, CO2 regulators, etc. 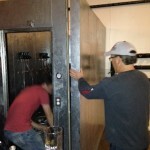 ), dissemble the fridge at the current brewery, and re-assemble the fridge at the new brewery. 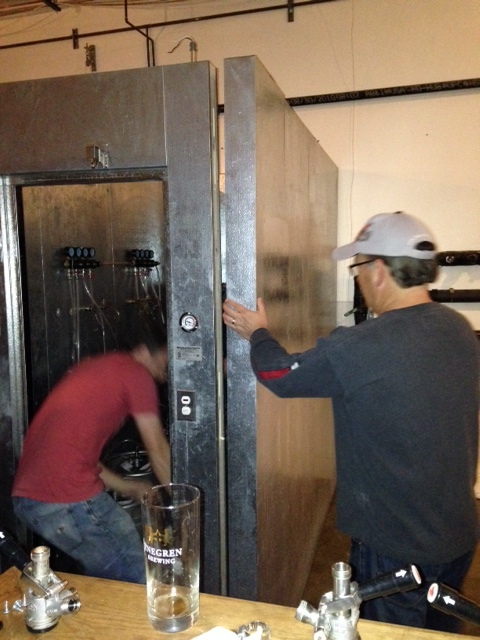 Break down the cold-storage fridge at the new brewery and re-install it in the current tasting room. 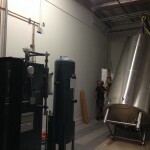 Transport all kegs that were at the new brewery to the fridge at the current tasting room. 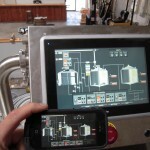 Re-install the tap system – all while making sure the beer stays cold. We now have our old fridge from Operation Frosty Box II in our current brewery and our serving fridge behind our new bar with a sprinkler in it. For the last few months we’ve been saying “the brewery is finally coming together” – but for the first time ever, it’s now actually coming together. The bar is finally finished. Fireman Dave poured 9 gallons of epoxy over this thing and it’s now ready to commence vigorous testing – hence the kegerator behind it. 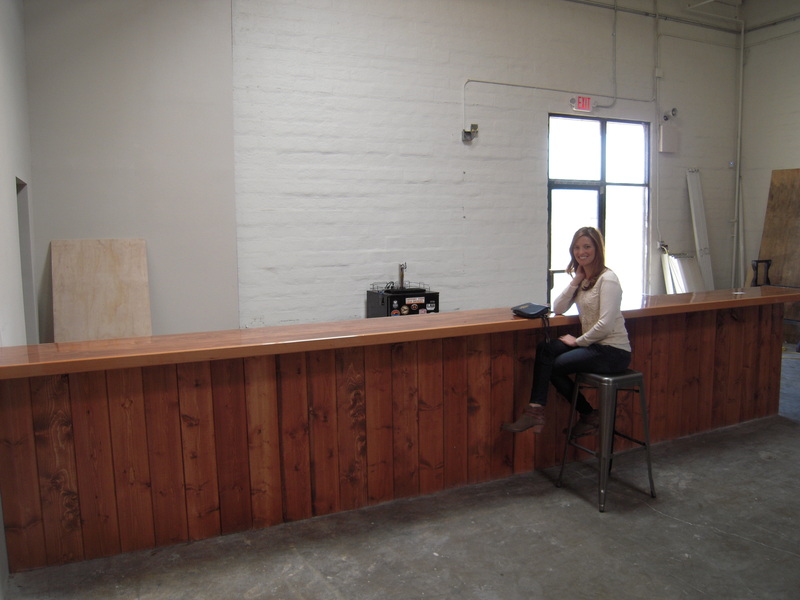 You may also notice that while modeling the bar, Brie had to put her purse on top of the bar. 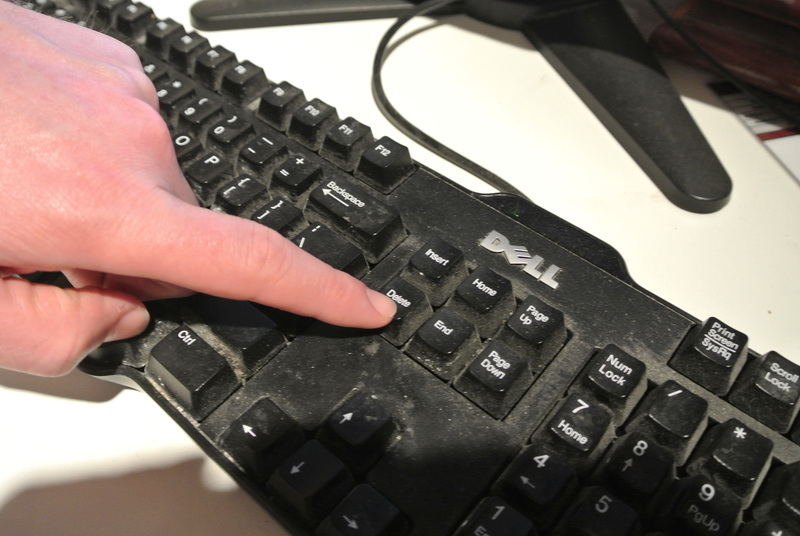 Don’t worry, we have a solution for that coming. 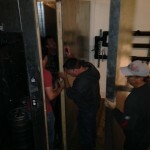 As some of you may remember from the build-out blog from our current brewery, there is a requirement that we separate the brewery from the tasting room with a wall. This time we decided to get fancy with it – and at the same time doubled its zombie defense rating from 10 zombies per minute to 20. 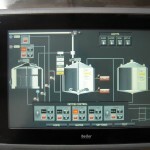 The brewhouse control system is debugged and ready to go. It’s waiting for a completed steam system before we can do a full hot water test. And don’t worry. The most important part of ANY steam system has also been installed. 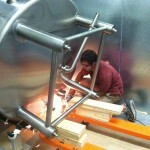 We installed a big air compressor to power the brewhouse horns. One might ask why one would need horns when one also has a whistle, but that’s just a stupid question. 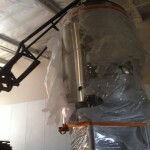 The air compressor will also be used to power our keg washer and air operated valves on our brewhouse and fermentors. We finally ripped out the gross florescent lights that come with pretty much all warehouses and put some nice barn-style lights and fans in. 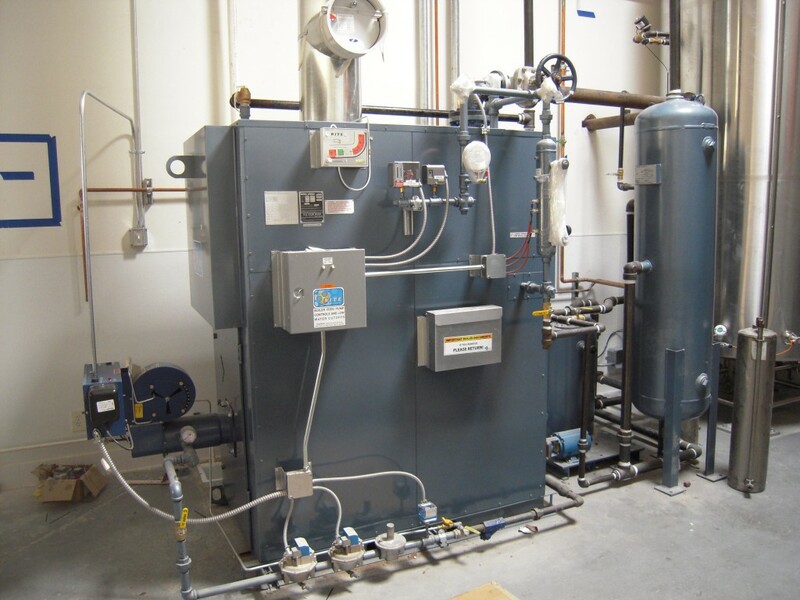 The glycol system has been one of the most labor intensive jobs. 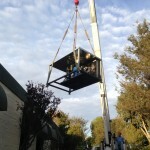 The chiller unit had been sitting in our tasting room for nearly 6 months while we figured out where to put it – it’s now on the roof. After we mounted the plumbing, each elbow and tee needed to be covered with an insulation casing and then filled with expanding liquid foam. This might sound hard, but it turned out to be really easy – thanks to the fact that Chris married a girl that has a really handy father who did all the work (thanks Fireman Dave). 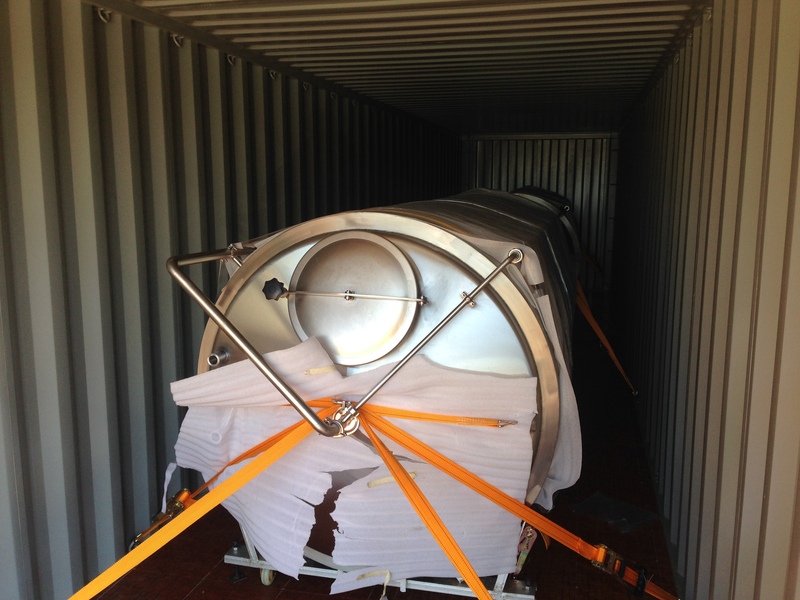 We’re within weeks of our first brew and pretty soon you’ll start to see some of the tanks pulled out of our existing brewery and put into commission at the new facility. 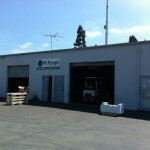 As soon as we get our final building and safety sign-offs we’ll start planning our grand opening. For the first time since we started Operation Dirty Green – our new brewery is finally starting to look like a brewery. But it didn’t come without harrow, suspense and determination. It all started the day before the tanks arrived – we needed to rent a boom lift with a boom extender to stand up the tanks. We had it all planned out, but the company didn’t have the exact boom-extender we wanted. They had one close enough, so we ordered it. No problem. Later that night, Chris was having trouble going to sleep – excited like a kid the night before Christmas. He finally managed to doze off, and that’s when the nightmares started. 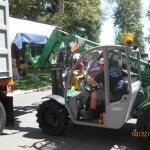 Twice he woke up worried the replacement boom-lift wouldn’t work and the tanks would be stuck on their side. At 3am in the morning he almost got out of bed and pulled it up on Solid Works to draw the boom to make sure it would fit. And finally, he had a terrible dream he was stuck in traffic and missed the tank delivery. Restless night of sleep finished, first thing in the morning Chris drew up the boom to double check everything would work. The model said it would – by a couple inches. 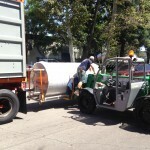 The tanks arrived in two shipments at 2pm and 3pm. 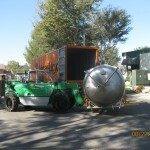 The first truck had the new grist case and our hot and cold liquor tanks. 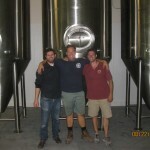 The second our three fermentors. 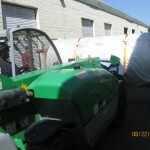 The timing was perfect, as soon as we finished unloading the first truck, the second arrived. 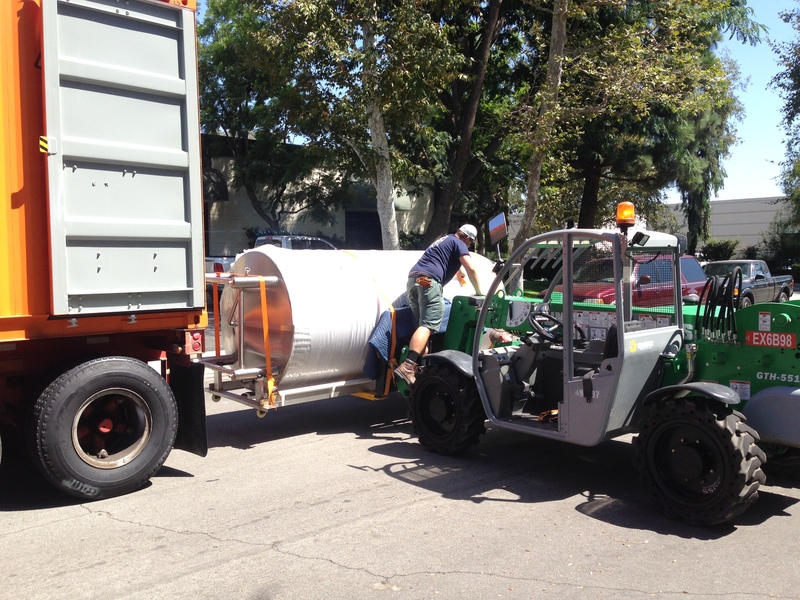 To pull the tanks out of the delivery trucks – we pulled them out part-way with Helga The Forklift. 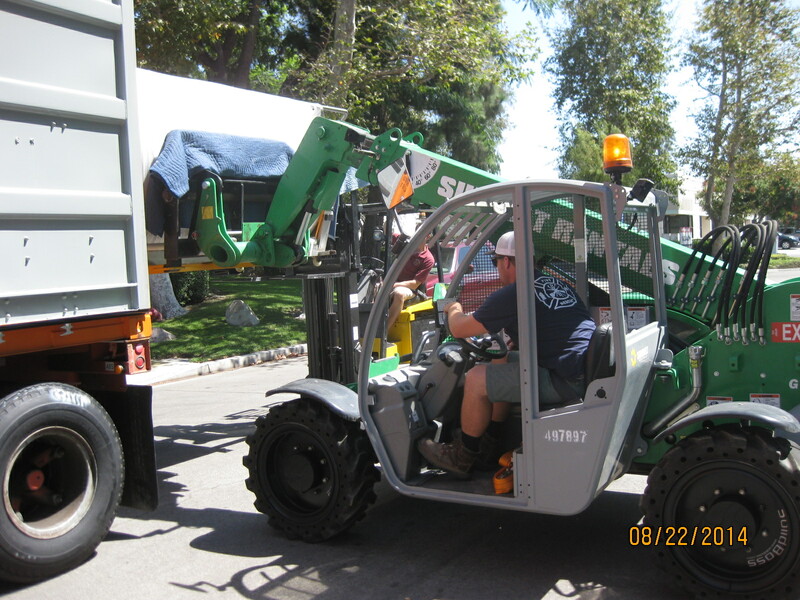 Once partially out, our rented boom lift grabbed them from the side and drove them down to the brewery. Needless to say, we took advantage of this good fortune and said yes. 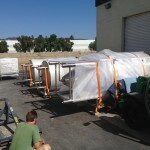 With the tanks all unloaded, we started to bring them into the brewery and stand them up. 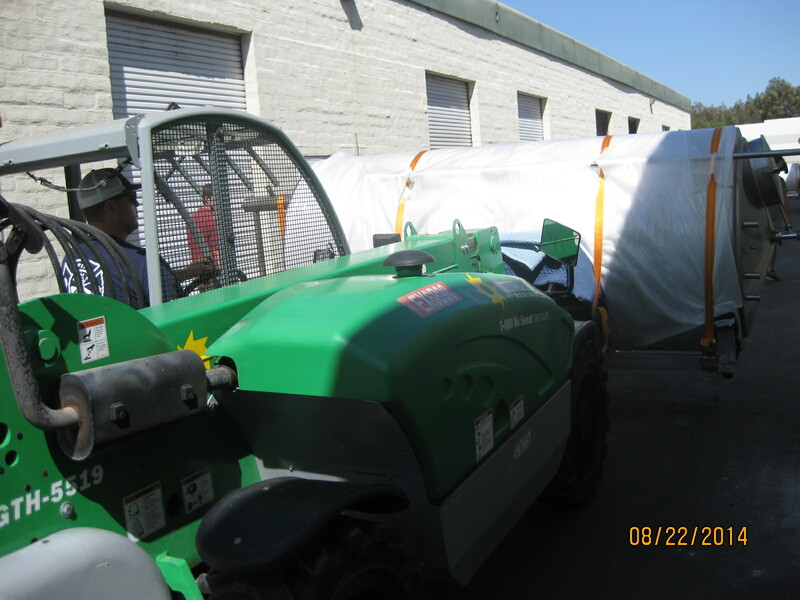 Unloading the tanks was nervous, but standing up the tanks was downright terrifying. 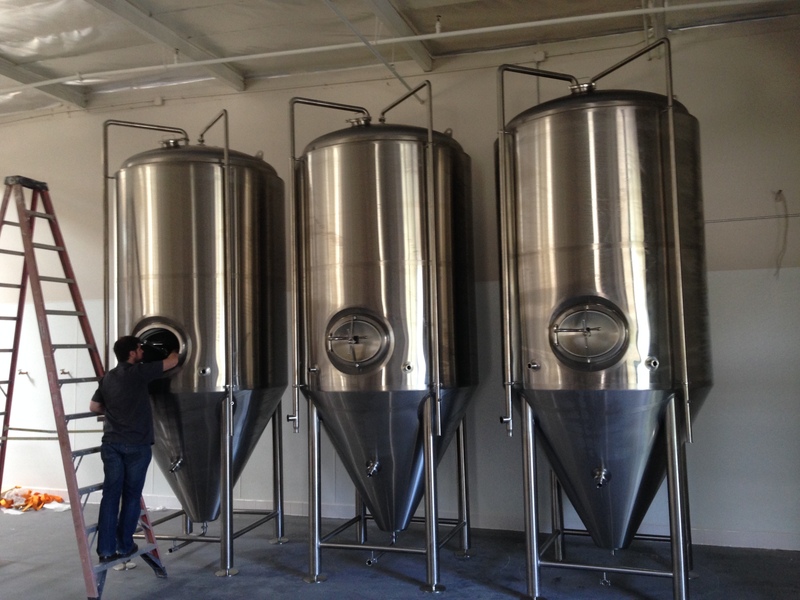 Our hearts were racing for the next 4 hours as we stood-up the tanks. 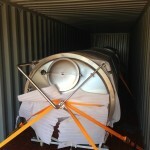 With baited breath we drove them into the brewery and lifted them up. 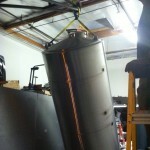 The boom-lift came close to the ceiling, but luckily it fit in the room and we stood the tanks up no problem. The first tank was the scariest, and the other two stood into place with ease. 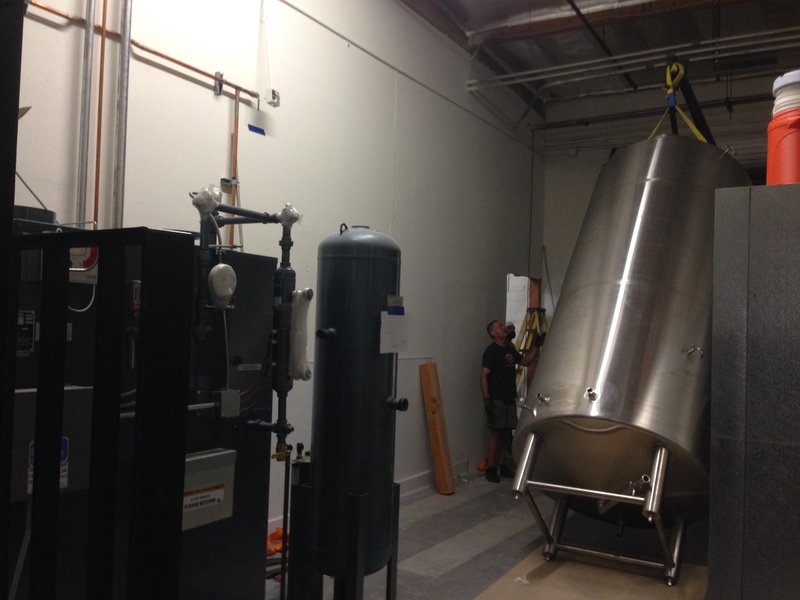 The final boss – standing up the two 30 BBL liquor tanks. These were markedly harder than the fermentors because they have shorter legs, we were standing them up in a confined space, and an expensive boiler was right next to them. The first tank proved quite the challenge. We got it to about 45 degrees and realized the legs weren’t long enough to tip up onto without damaging the port at the bottom. So, we had to cut off part of the transport rack to pull it away. 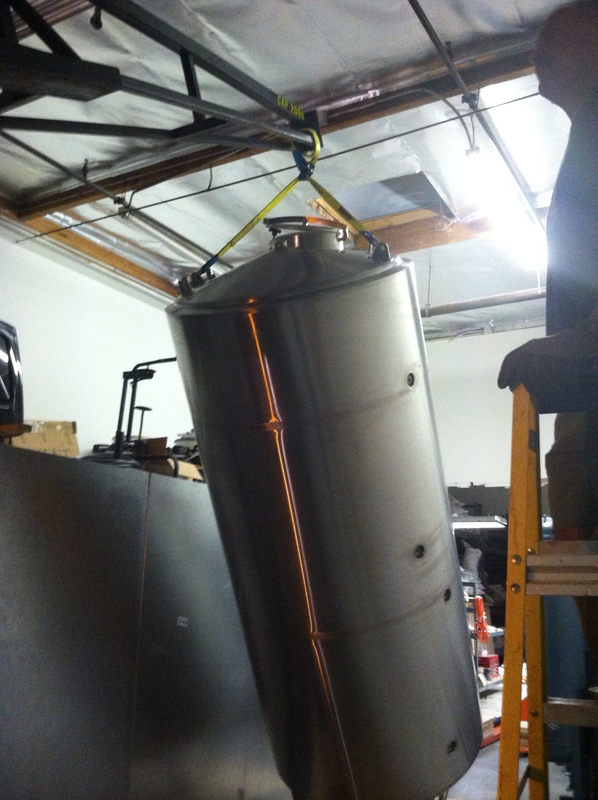 Then, while lifting the tank up the strap got caught on the manway door and almost bent the whole thing out of shape. And finally, when the tank was almost up, Chris’s dream nearly came true. 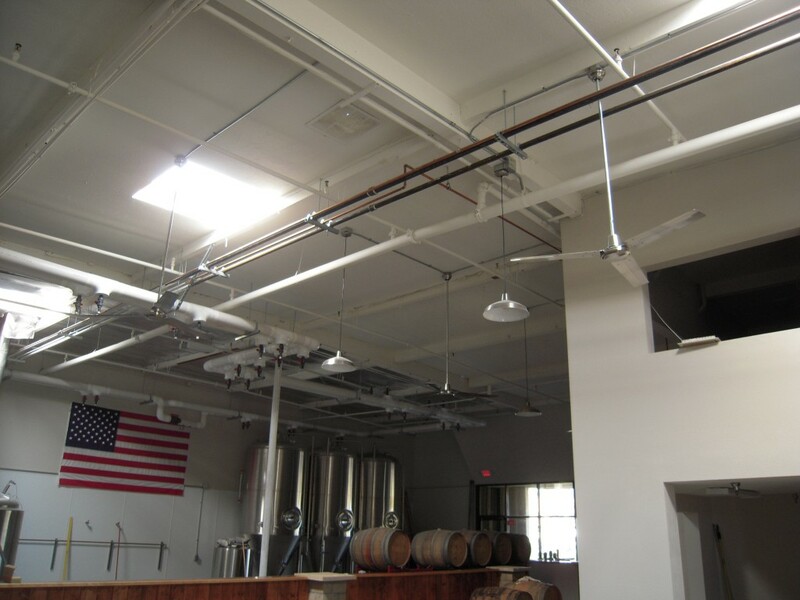 There was an electrical conduit running across the ceiling – too low for us to stand up the tank. Luckily we were able to grab a pole and push it up, just enough to let the boom through. 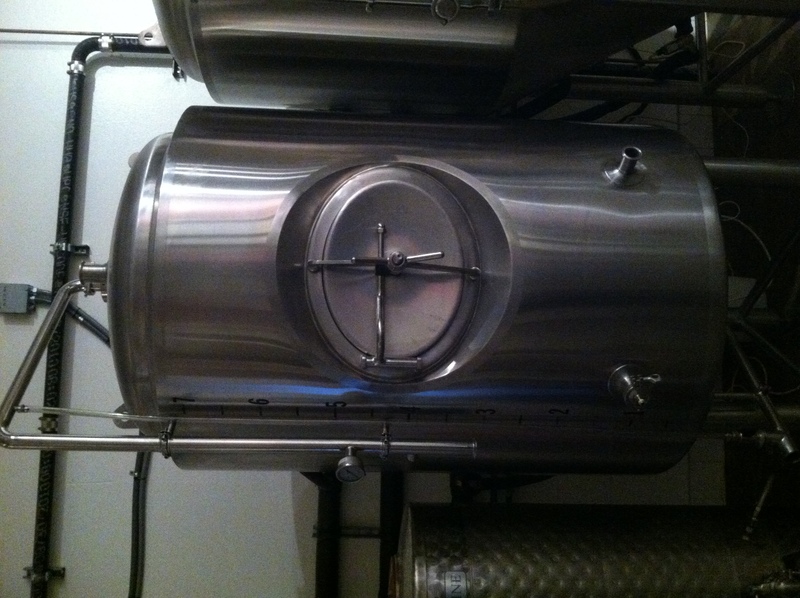 And like the fermentors, the second tank was a piece of cake. 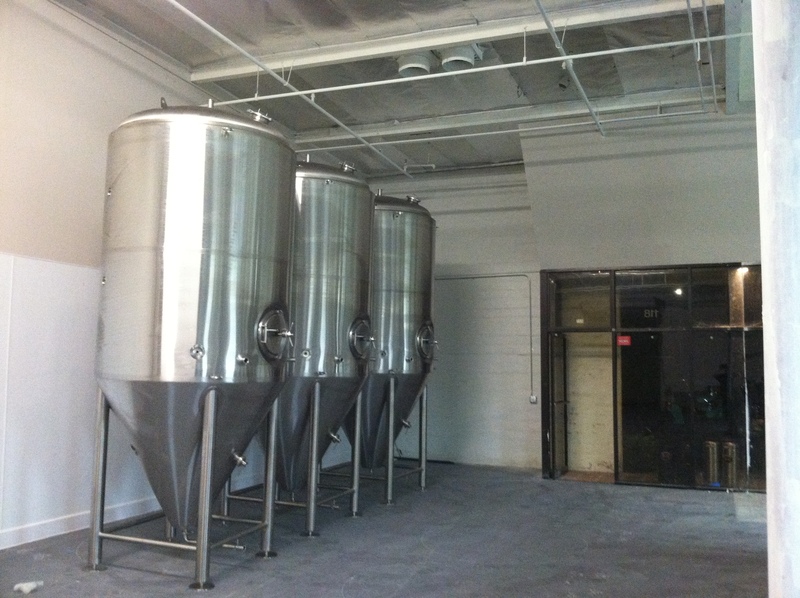 All-in-all the entire process took 8 hours – and finally our new brewery is starting to look like a brewery. 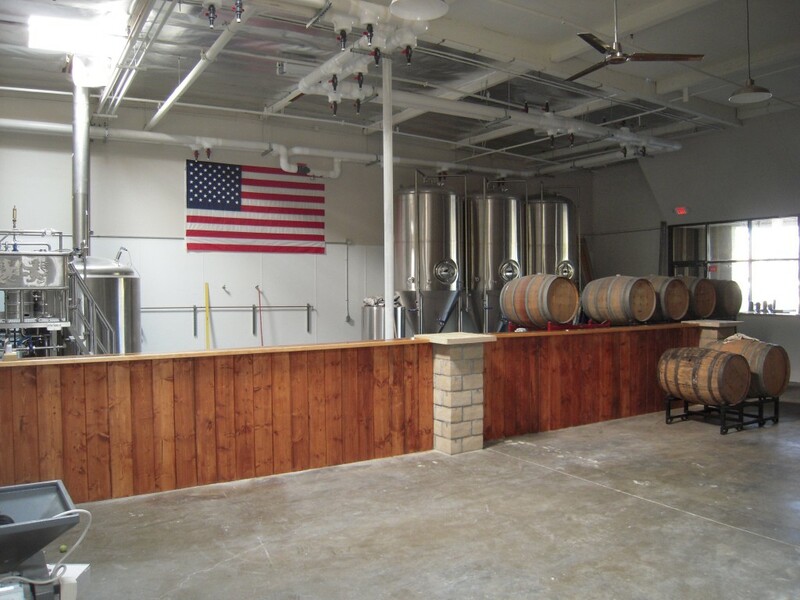 Be sure to check it out next brewery tour on September 14th. Post by Enegren Brewing Company. 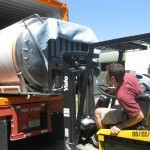 Back in mid-March we picked up a new bright tank from Ladyface Brewery as part of our brewery expansion. 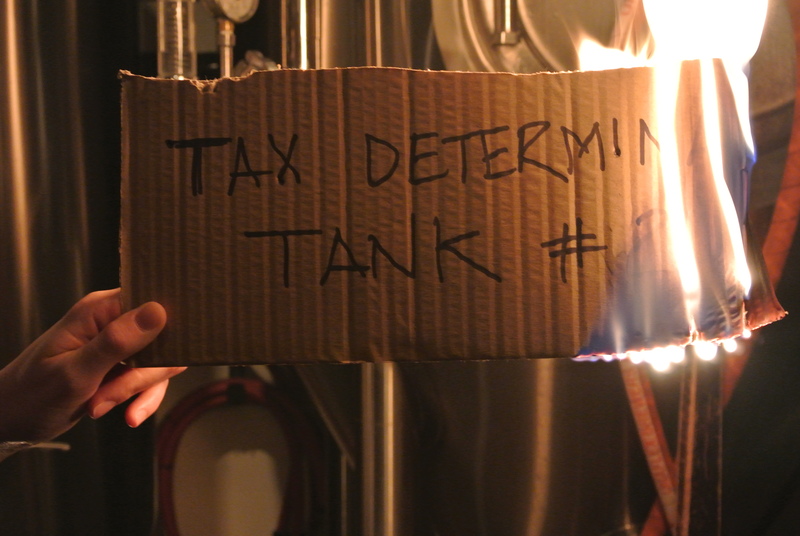 It was named “Tax Determination Tank #2”. We needed to fill it with our 2nd year anniversary ale, but as you may know, all tanks at the brewery must be named after ladies in German drinking songs (or at the very least a ladies name) – otherwise it is bad luck. 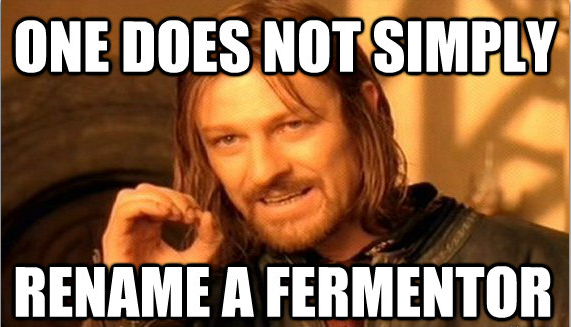 Renaming a fermentor is not a simple task. First all traces of the old fermentor name have to be removed from our records. 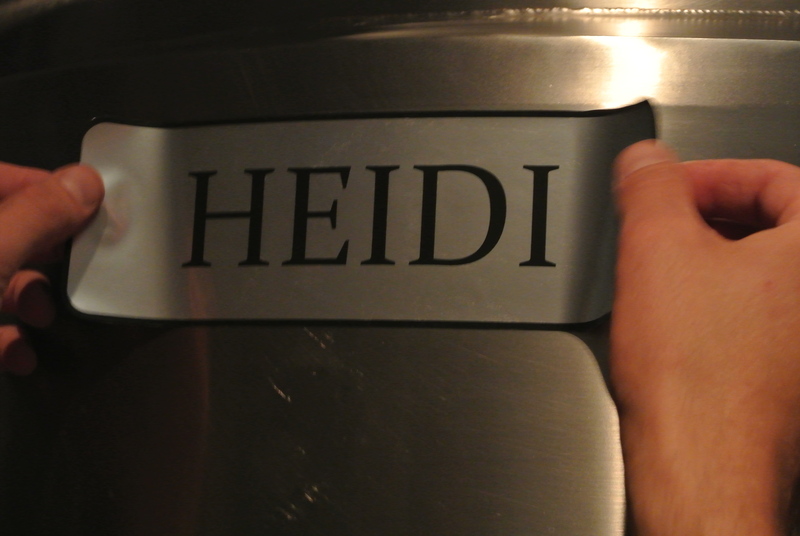 Second, the old fermentor name needs to be purged from existence. 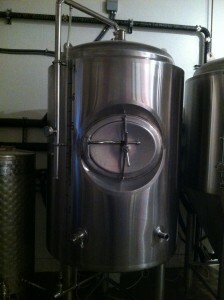 And lastly, the fermentor needs to be renamed and christened in preparation for the beer. We were sure to perform this procedure at night while we were closed. If one false word was uttered, things could go very wrong – Indiana Jones and the Ark of the Covenant opening wrong. First step was to remove all traces of the old name from our records. This included deleting the name from our fermentation gantt chart. 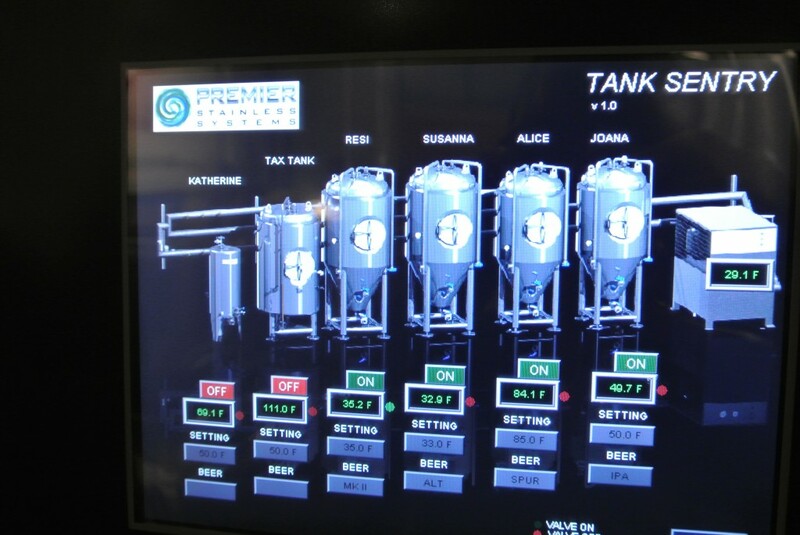 Then removing the name from our fermentation control panel. 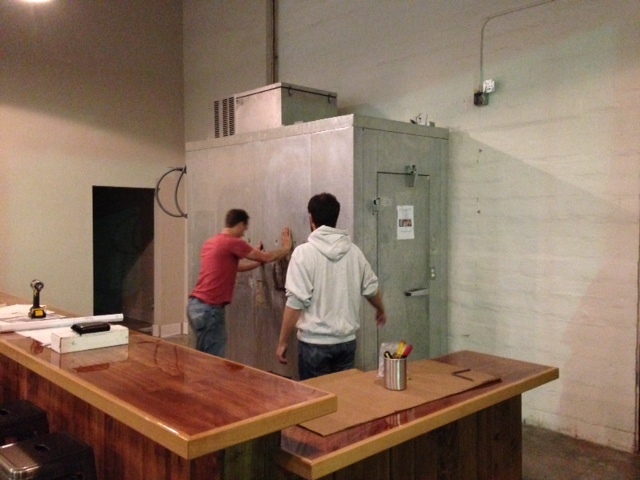 And finally erasing of the name on the bright tank itself. Fog began to roll across the brewery as we prepared our final speech to remove the last of the old name. Captain Chris’ bosun’s whistle rang clear through the night. 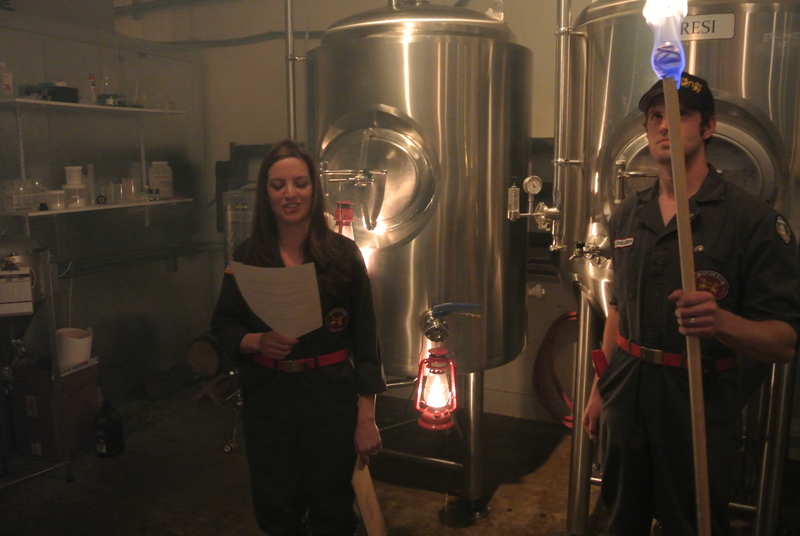 And on cue, Brie delivered a speech that will long be remembered for those few brewery personnel there on that foggy night. Oh mighty ruler of the fermented fruits of the barley, to whom all men and machines who venture upon your vast domain are required to pay homage, implore you in your graciousness to expunge for all time from your records and recollection the name “Tax Determination Tank #2” which has ceased to be an entity in your kingdom. 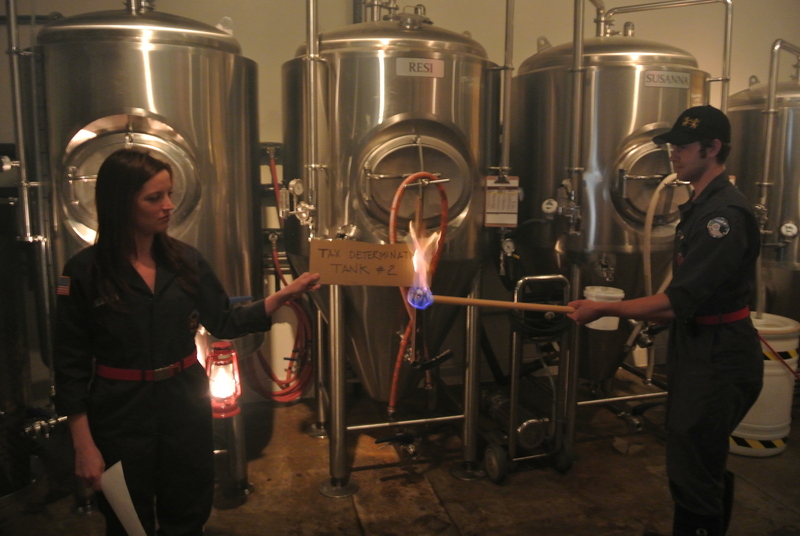 As proof thereof, we submit this burning symbol of this vessel’s previous name. Pause was given to light the last symbol of the old tank aflame to burn into embers atop the trench drain. As the flames died down, Brie started up again. We give thanks to Ladyface Ale Company who served with this beautiful vessel in the past and kept her clean and free from the horrors of beer stone and mineral deposits. May the purging of this name from the ledgers of the deep bring forth a new beginning for this glorious vessel and a bright future for her new deployment as a bright tank in the Enegren Brewing Company. And with the old tank name purged from existence – it was time to rename the tank. First we carefully applied her name. And then, with all the usual pomp and circumstance with a new tank we began the christening. We ask you for your blessing of this bright tank. 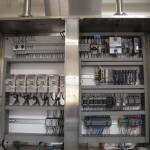 May her glycol jackets cool efficiently, her ports seal tightly and her gauges read true. May all brewers who serve on her go unharmed by the perils of craft beer and may you bless this glorious vessel and give her the strength to carry the Enegren Brewing Company onward and upward. 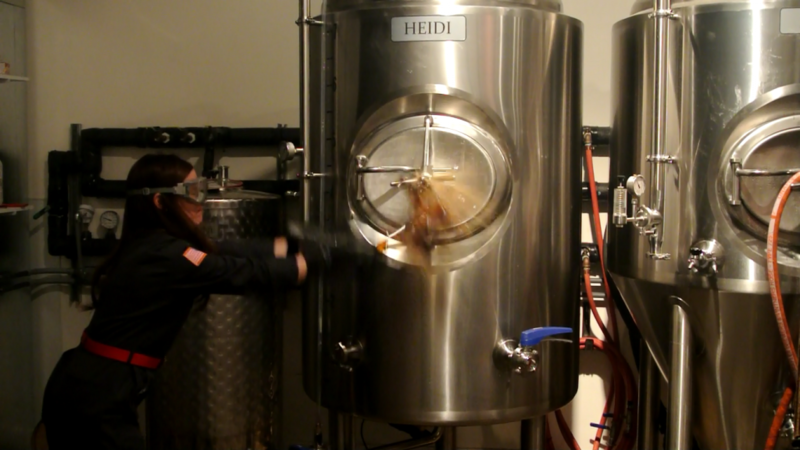 And so, after the breaking of the beer bottle on our new tank Heidi, she now embarks on her continuing mission to brew new beers and boldly go where no fermentor has gone before. 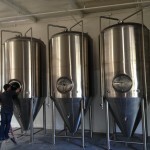 Part two of our brewery expansion blog post series. If you missed out on Part I, you can catch up here. 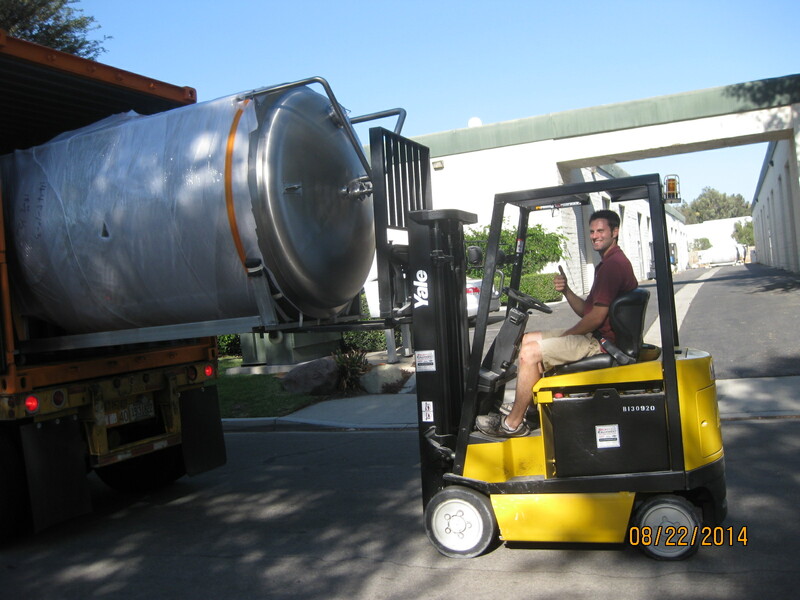 The first part of this phase involved Captain Chris driving the BT1 (Brewery Truck 1) down to San Marcos to pick up the new fermentor. This, of course, also involved staying down there for an extra night hobnobbing it with other breweries and having a few beers. Market research. 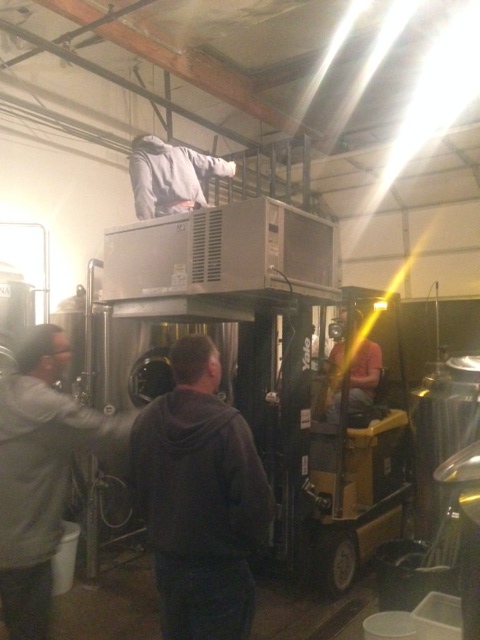 After we unloaded it at the brewery, it was time to use our good friend the rotohammer again and anchor the fermentor to the ground. 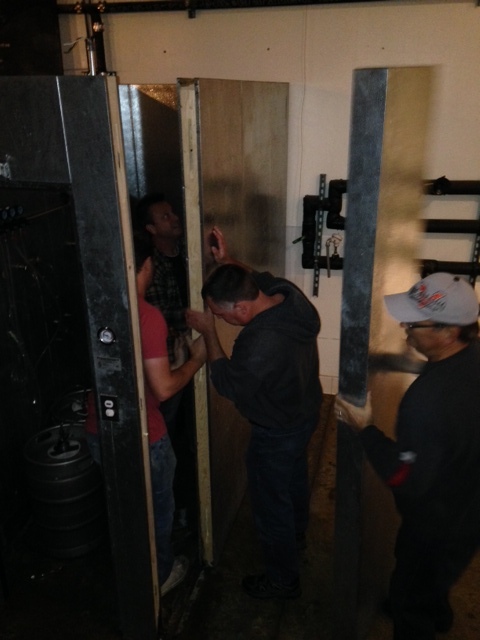 Then, we began Operation Frosty Pipes II and extended our glycol line down the wall with ports for several fermentors to come. 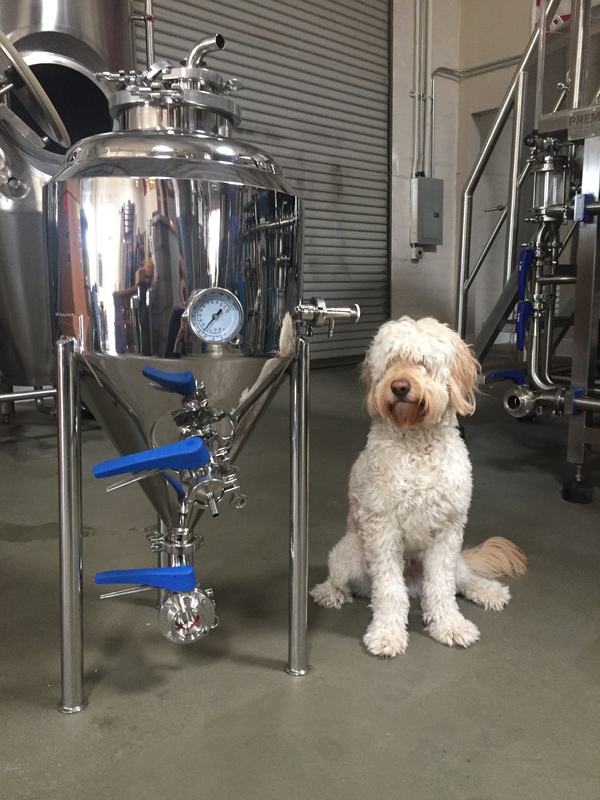 After we hooked our new fermentor up to the glycol lines, it was time to christen the new ferementor “Resi” right before we pumped our first batch over to her. 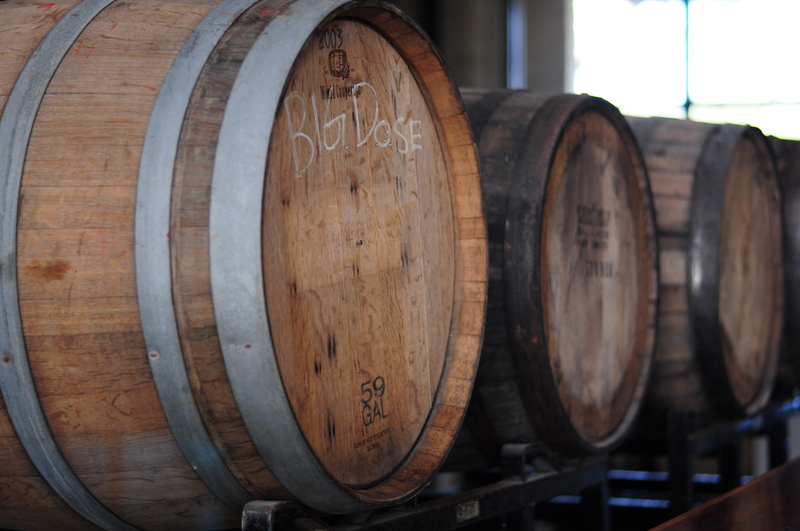 With the increased storage over at the other location, we have the ability to store more barrels and expand our barrel aged beer program. To start off we got 6 Jim Beam bourbon barrels, thanks to The Bruery ordering extra for us. 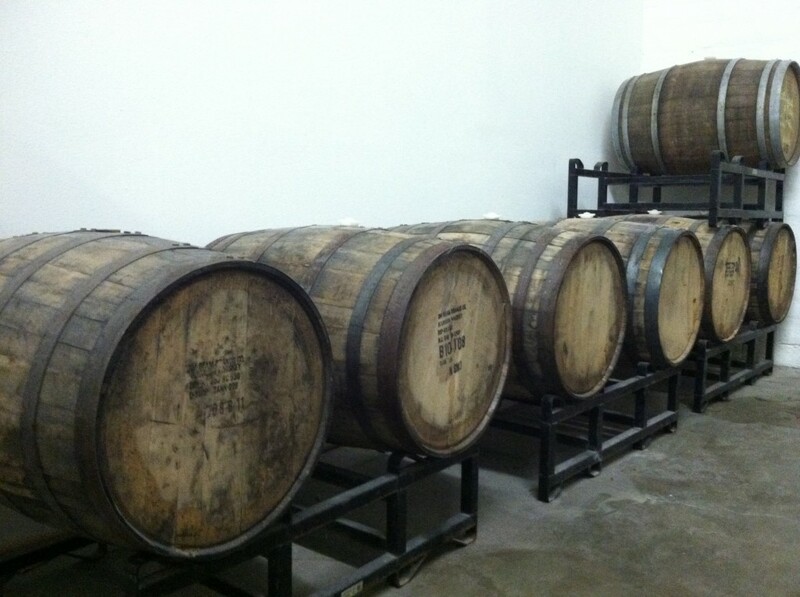 We have four of these filled with Daniel Irons Oatmeal Stout, and one filled with Black Valkyrie. What will we fill in the remaining barrel? At this point, only time will tell – but rumor has it, it could be an IPA. This was a surprise expansion phase for us. 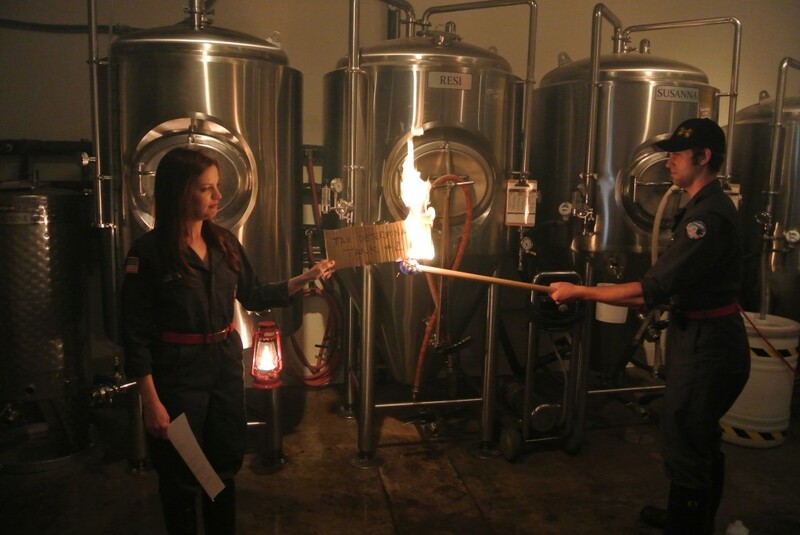 While some phrases are banned from the brewery like “accidental validation” or “unmarked chemicals” (safety first! ), “surprise expansion” is not – and is in fact welcomed. 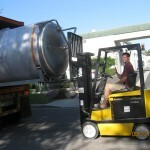 Ladyface Brewery is currently upgrading the size of their tanks, and we were fortunate enough to be offered one of the 7bbl tanks they are replacing. 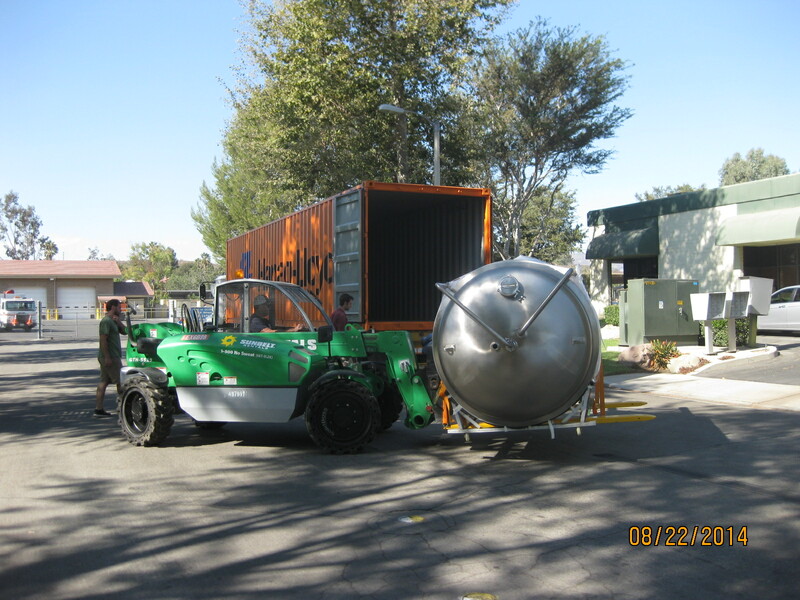 So we stopped by one afternoon, picked it up and delivered it to the brewery. It should also be noted that Fireman Dave purchased a new and improved roto hammer which cut our cement drilling time down from 5 hours to 10 minutes. May we never speak of the old roto hammer again. In an effort to provide even more seating than previously imagined in Phase IV of our expansion plan – the brewery crew got creative and smashed down the wall separating the office and the tasting room. We had several options of how to tear down the wall. 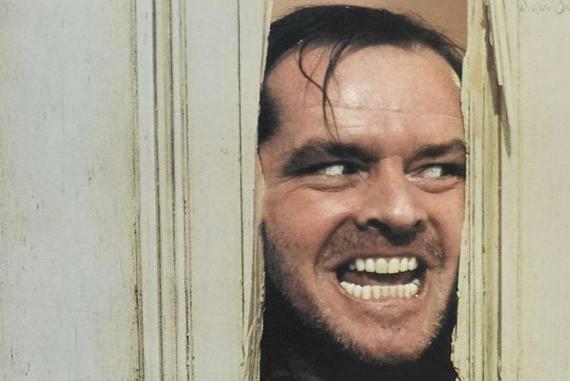 The first was the classic move from The Shining – only problem is it didn’t tear down the wall completely and was just a little creepy. 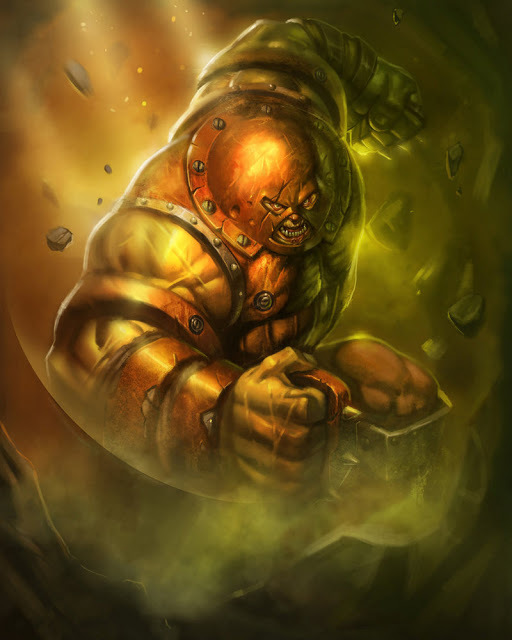 Our second option was to tear down the wall X-Men Juggernaut style – but we were afraid that we wouldn’t be able to stop before crashing into our brewery. Our third and final option was to relive our childhood and attempt the classic Kool-Aid “OOOOHHH YEAAAAAHHH” wall breakdown. 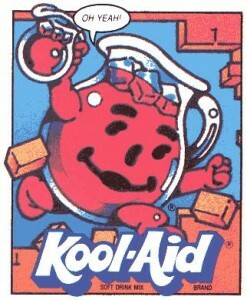 After some debating, we decided to go for the Kool Aid wall breakdown – but it didn’t go quite according to plan. You can see for yourself in the video, but it turned out to be more of a cross between The Shining and Kool Aid. 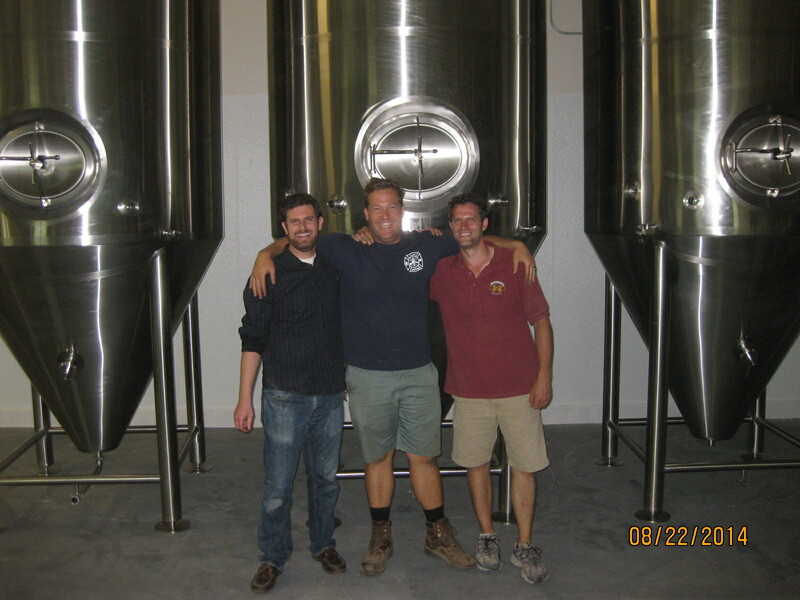 Stay tuned for the third and final installment of our Brewery Expansion! As stated above, it all started on the night of August 26th. Commander Matthew was working his side job as an accountant so Captain Chris and Chief Joe were left alone to tend the brewery by themselves. Our third batch of Protector Imperial IPA was at the end of primary fermentation and we started to cold crash it. Our normal procedure for fermentation is: Primary fermentation, cold crash, pull off yeast, add dry hops, condition and keg. 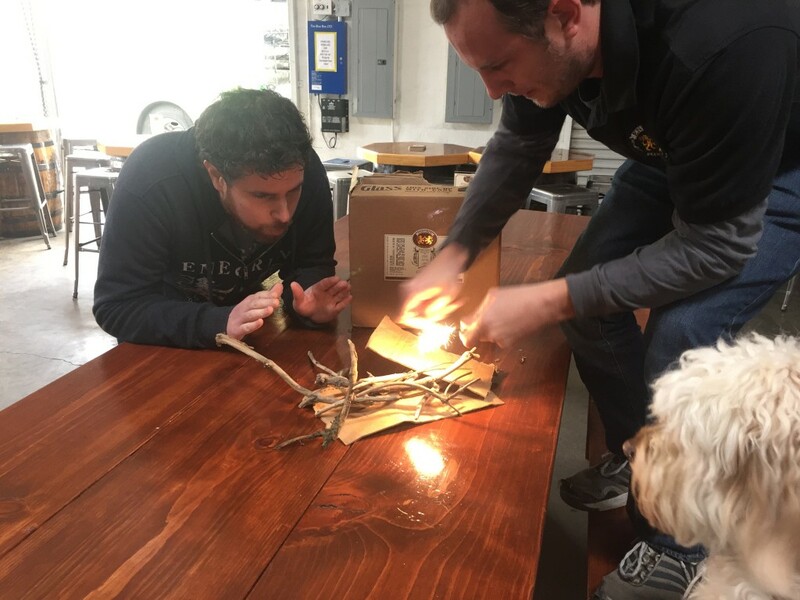 For some reason, Chris and Joe thought “why not add the dryhops while it’s starting to cold crash?” It wasn’t our normal procedure, but we began adding the hops regardless. To this date we are not sure why. 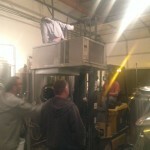 We moved our ladder to the fermentor and climbed up top to add the hops. As the first pound was added, Commander Matt arrived, eager to help the brewery. 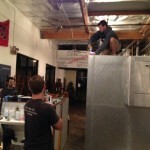 Matt joined Chris climbing half up on the ladder while Joe stood guard on ground in case beer stealing zombies attacked. Second pound of hops added – no issues. Chris, on the ladder, began to add the third pound of hops. 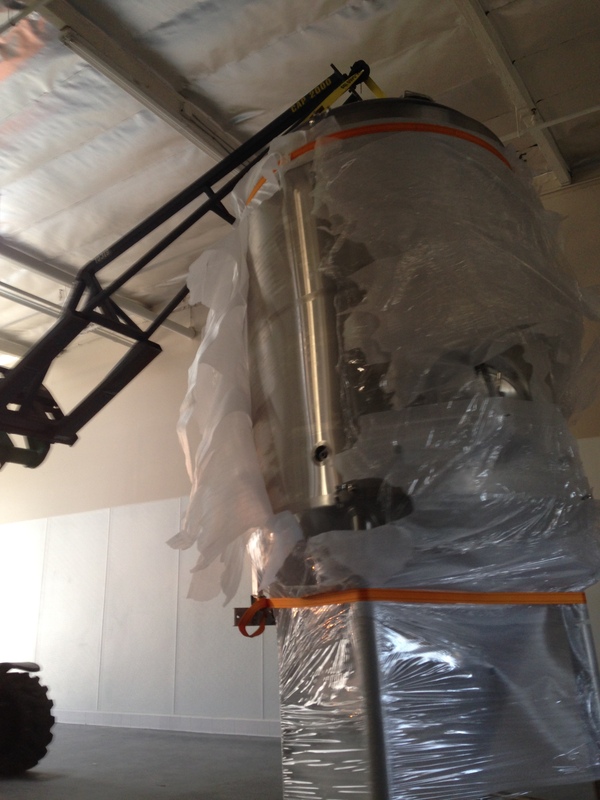 The brewery crew quickly realized that beer began foaming out the top of the fermentor where we added the hops. Chris quickly covered the hole. 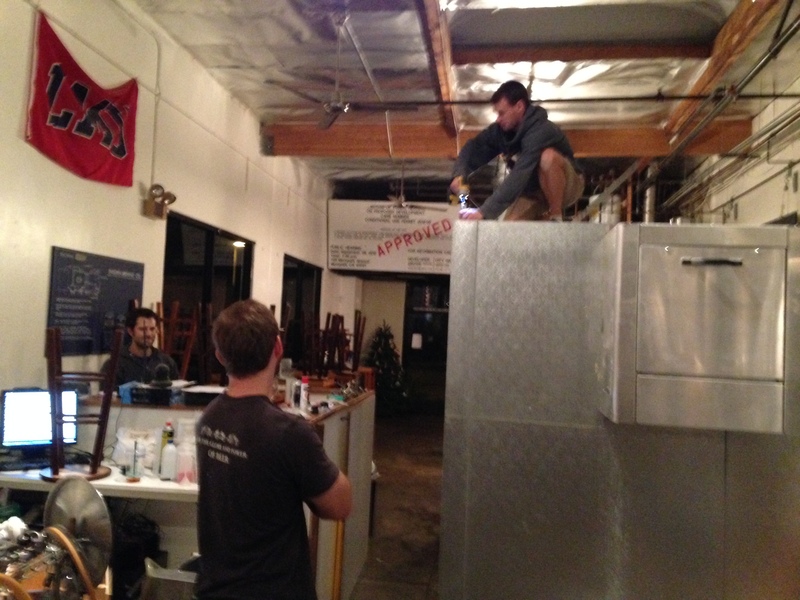 Beer instantly started shooting out of the vent tube near Joe’s feet while Chris clamped down the hole up top. 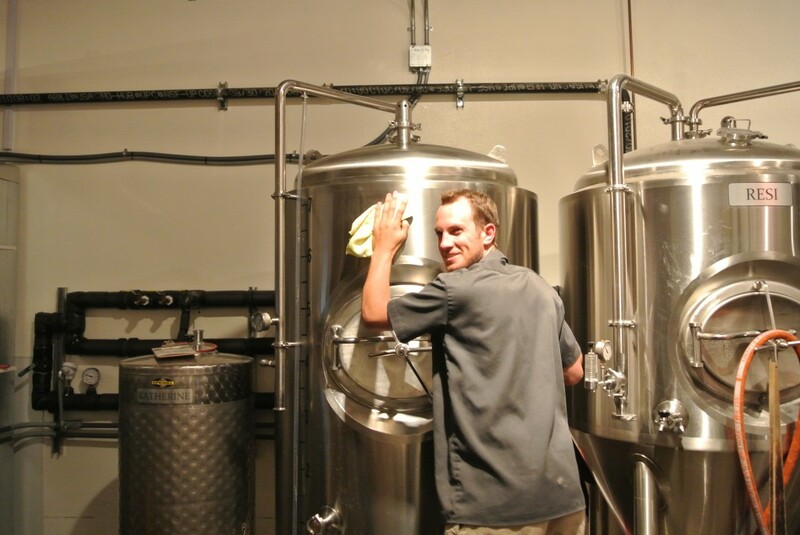 When Joe covered the hole, pressure in the fermentor built up and started spraying beer out the top hole all over Chris’ face and the brewery. The three brewers stood there for what seemed like nearly a minute, watching the beer shoot across the brewery not knowing what to do. Eventually Matt had the good sense to grab one of our grain buckets and put it underneath the vent tube to catch all the beer. We stood there, beer/foam flowing freely into the bucket until the foaming subsided. Not fully understanding what just happened, covered in yeast and beer, worried that we had just ruined our batch of Protector, we began to clean up the mess. Luckily the beer turned out fine – though a bit hoppier than batches past. We learned valuable lessons… like never add dryhops to a fermentor without cold crashing the fermentation unless you want a mess of beer over the brewery. And if you are lucky enough to try this batch of Protector over the next couple weeks, you can really taste the explosion in it. That’s right, Matt is addicted to cell counting. Yeast cells to be exact. Before we repitch our yeast into the fermentors, we need to get a yeast cell count and determine how viable our yeast is. Each batch of beer requires a different yeast pitching rate. For example, our Imperial IPA we pitch fewer yeast cells for a slower and warmer fermentation that produces more flavor compounds. Our CA Altbier we pitch more yeast cells for a quicker and colder fermentation to generate fewer flavor compounds to give it a cleaner finish. In order to know exactly how much yeast slurry to pitch, Commander Matthew Enegren – first string cell counter – mixes 1ml of yeast slurry with 100ml of distilled water. The mixture is stained with Methylene Blue. Dead cells turn blue when stained, but live cells metabolize the Methylene Blue and do not change color. 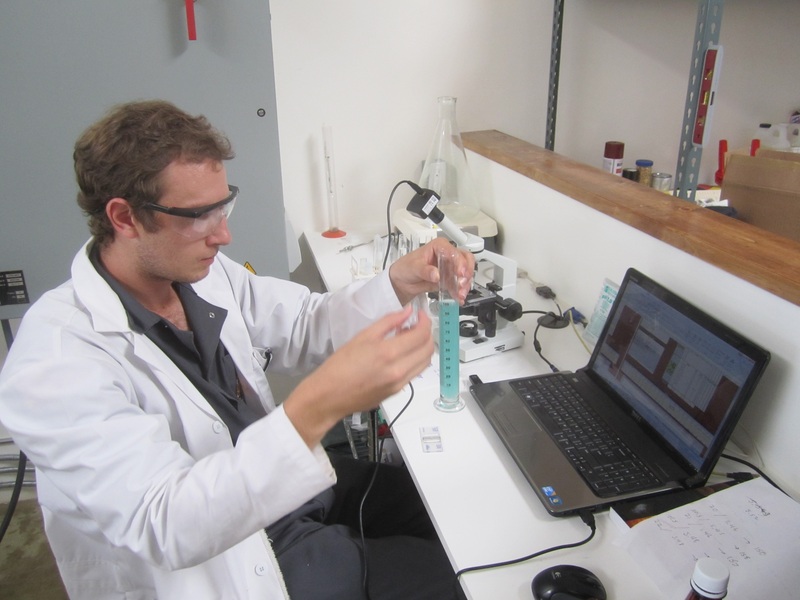 As long as 95% or more of the cells are living, we re-pitch the yeast. This is one of the most crucial steps of the brewing process. Under-pitching or over-pitching the number of yeast cells for each brew can greatly influence the flavor of each batch. Matt is most qualified for this job since it involves a lot of counting and Matt is an accountant – he is therefore able to account for living cells much better than Captain Chris or Chief Joe. 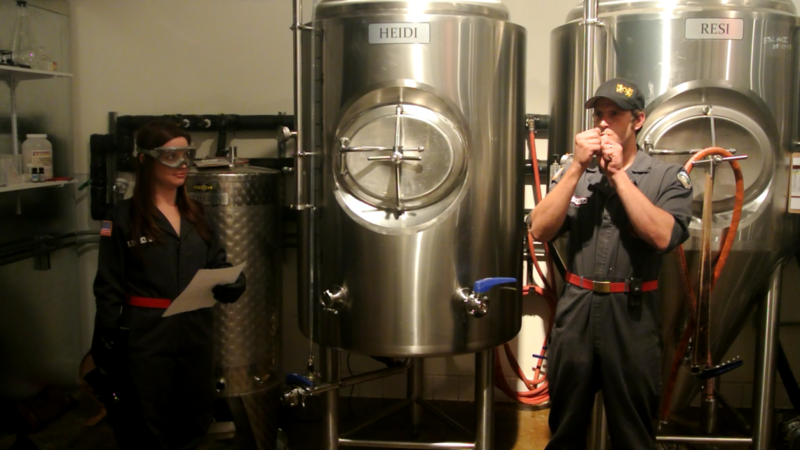 Now that our first beer is out on tap, let us tell you a tale about the brew. The only thing that kept us going through our 27 hour brew day was the awesome thought of creating a good tasting beer for people to enjoy. It’s the reason we we brew – to provide good beer to others. 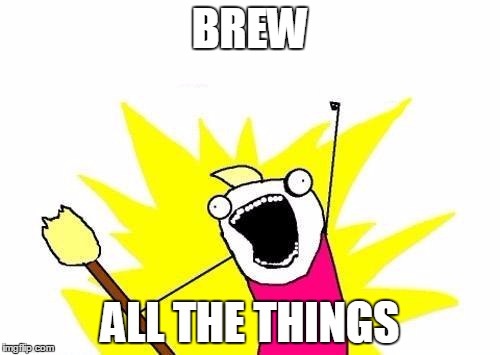 But brewing doesn’t stop at the end of the brew day. There is the fermentation period where 1-2 degrees difference in temperature can change how the beer tastes. This is an important step that we were watching closely – hoping, praying nothing went wrong. Now that the exposition is out of the way, let me tell you the tale. It is a tale of perseverance, bad fortune, witchcraft, love, revenge and awesomeness. Chris, like anyone starting a small craft brewery, had to go to the hardware store yet again. (A recurring theme in this blog.) So off he went thinking sweet things about the brewery and the beer, unaware of the demons he’d be fighting later that night. 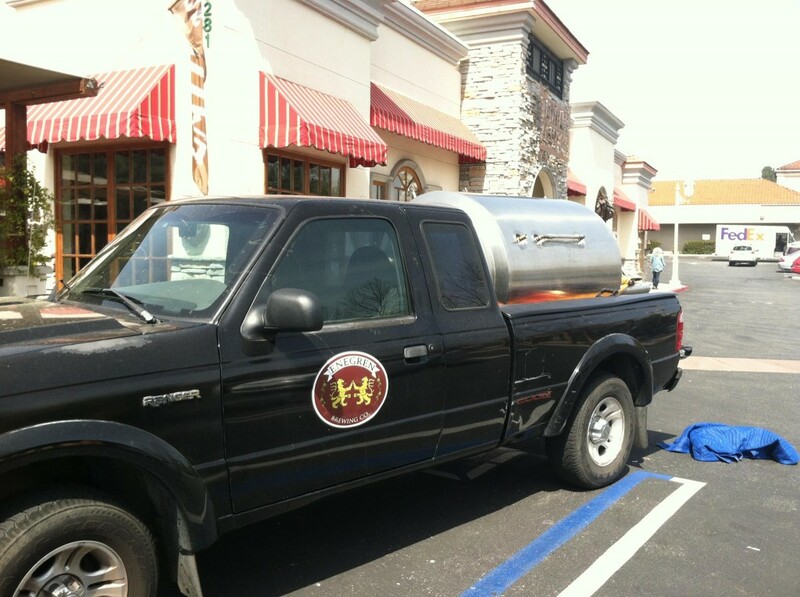 While at the hardware store, Commander Matt arrived at the brewery. Like the Captain, he saw a puddle of liquid on the floor. But he wasn’t as quick to rationalize it to condensation. He walked up to it and touched it. “Slimy” he thought. The word mulled over in his head for a bit. And then mid-thought it hit him like a ton of malt. He distinctly remembered Chief Joe slipping and nearly falling on some glycol he spilt while filling up the chiller. Panic set in on his face as he immediately reached for his phone and dialed Chris while simultaneously running toward the glycol chiller. Chris’ response can not be shared on this blog. Chris hastily paid and left the hardware store, thinking only of beer. He’d later admit that after the teller checked him out and said “thank you” he muttered “beer” instead of “you’re welcome” as he ran toward the car. 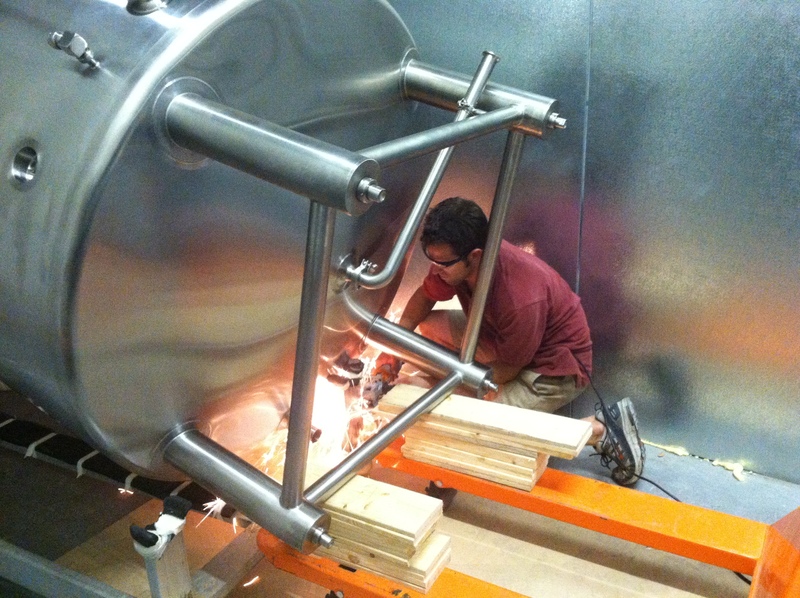 Meanwhile Matt was furiously removing the 12 screws that held the panel over the pump. He finished just as Chis got home. What ensued was a healthy mix of panic and chaos. Panic and chaos only one would understand if they had just spent the last year of their life building a brewery, then brewing for 27 straight hours, then realizing that your first batch might fail because of a busted pump. But out of the disarray, out of the madness, one thought remained clear. We would not let this beer down. Taking a step back, Chris remembered that he had the cell phone number for Jim, President and CEO of Pro Refrigeration, makers of our glycol chiller. They barely had said their goodbyes when Chris hung up the phone determined to take apart and rebuild the pump. This turned out to be a mistake. They had to take off the impeller. 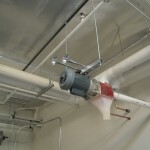 The Impeller was glued tot he pump shaft. Removing it cut up both Chris and Matt’s hands. They spilled glycol everywhere and, though not toxic, it stung their cuts like rubbing alcohol. 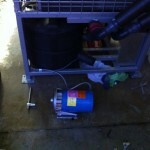 And despite taking apart and putting the pump back together several times, it continued to leak. They went to bed at 1am defeated, frustrated. They were covered in glycol and worried something horrible would befoul the beer. However, as promised, Chris got a call first thing in the morning from Pro Refrigeration. 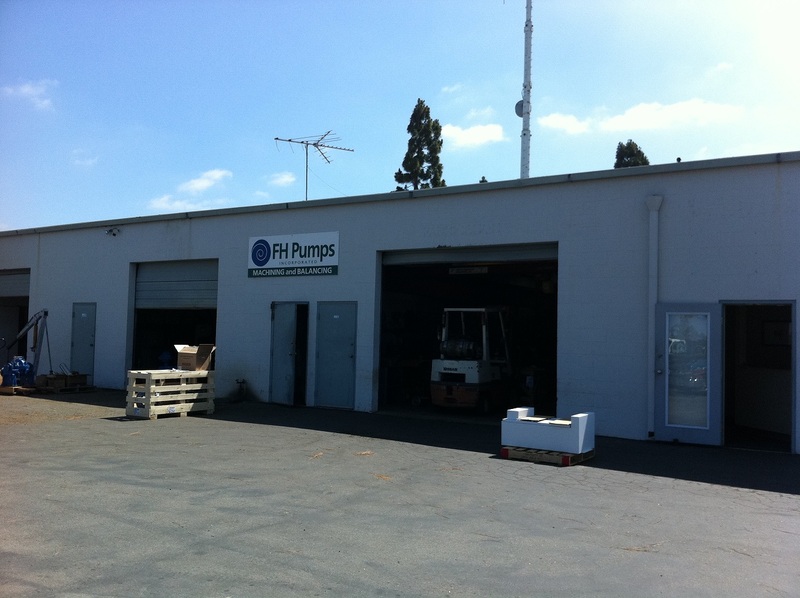 They called just about every pump repair service station in the area and found a place in Ventura able to fix the pump. Chris took a day off from work and drove there to get the pump repaired. The place took it apart, commented that everything looked fine, replaced the mechanical seal and put it back together. 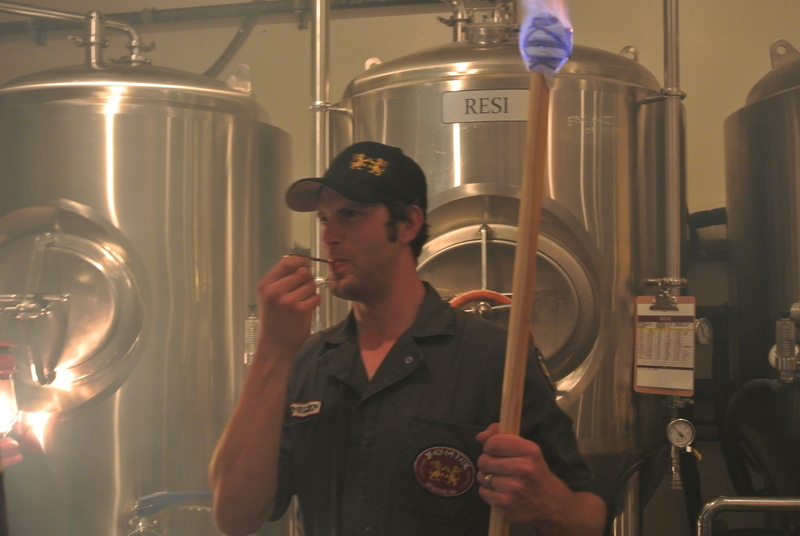 Chris hurried back to the brewery wishing he was an ambulance, police car or something with a siren. It was a hot day in Ventura with temperatures pushing 95 degrees. The longer it took to get the pump back online, the warmer the beer would get. Time was of the essence. 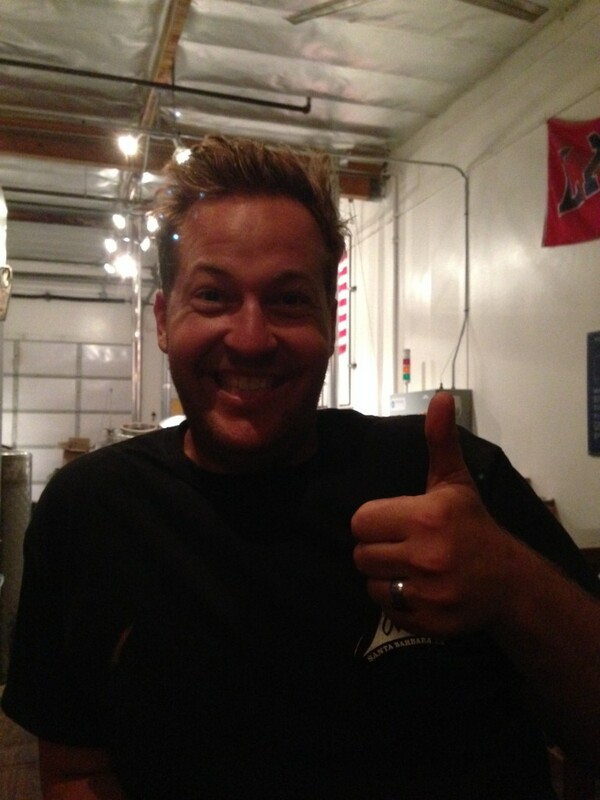 Chris got to the brewery and literally sprinted from his car to the brewery. Had he not been driving, he probably would have attempted one of those tuck-and-roll stunts out of moving cars you see in the movies. It was a good thing he was driving. Such antics could have damaged the pump. Chris mounted the pump with great speed, wired it back in, connected the pipes and took a deep breath as he turned it on. Leak. One big fat leak. Glycol spilling everywhere. Once again, some things were said that can’t be repeated here. 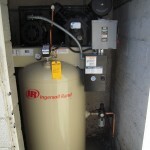 Chris called Pro Refrigeration again and explained the issue. They made some phone calls and found that the same store Chris was just at could build a brand new pump right quick. Chris ran back to his car and drove to Ventura, this time wishing he had some sort of rocket jet. He got the pump, drove back to the brewery, wired the pump in, connected the pipes, took a deep breath and turned it on. Leak. One big, huge, fat, gigantic glycol everywhere leak. But wait a minute. WAIT A MINUTE. The leak was coming from a different area. The leak looked like it was coming from one of the drain nuts on the pump head. Frantically Chris removed the nut. No gasket. Luckily, thanks to our homebrew days we had extra corny keg gaskets. Chris found one, put it in, sealed the pump back together and turned her on. Chris swears he watched it for 30 straight minutes to make sure, but there was no leak. 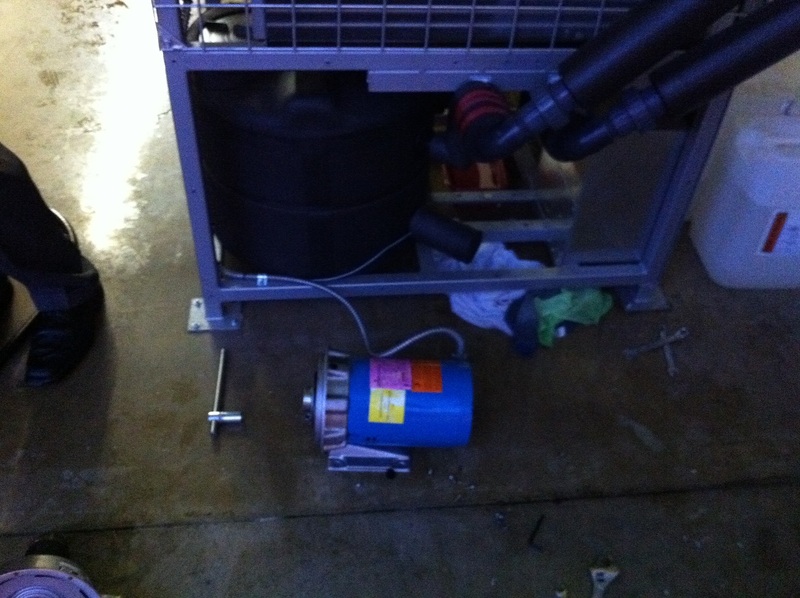 The chiller was fixed. When all was said and done, the beer temperature only increased 2 degrees. And now our beer is on tap and tastes pretty good if we do say so ourselves. 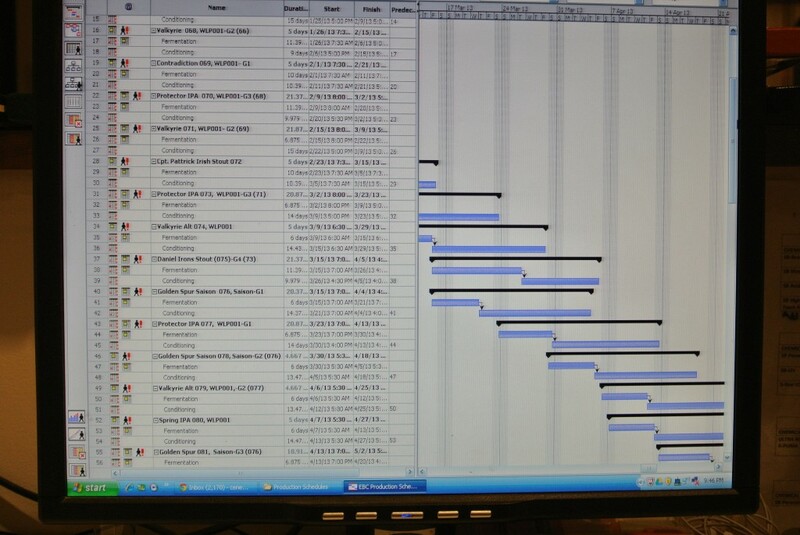 We just hope we don’t have to repeat this process our next brew to get the same flavor.